Last week, Rog and I spent an enjoyable couple of days around Rutherglen. Unfortunately, our car demanded a new battery, so my birding was thwarted a little, and I couldn't get to all my favourite spots. I walked around Lake King, strolled around Wonga Wetlands, visited Wahgunyah, checked out Chiltern No 1 and 2 dams, and had a quick look around Cyanide Dam. Then I ran out of time. There were two highlights: Sunday Creek at Wahgunyah and a mimicking Grey Shrike-thrush at Chiltern No 2 dam. 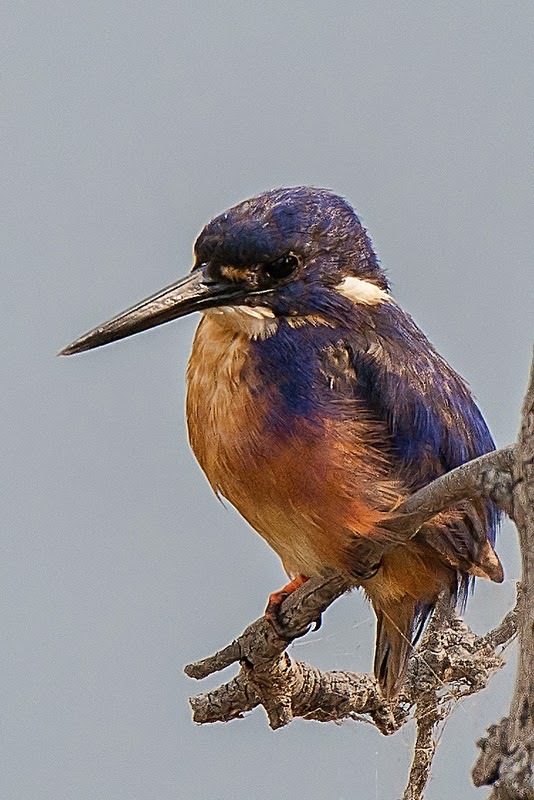 Jim O'Toole, a Rutherglen bird photographer, (who, I'm delighted to say, I met because of this blog) took me to Pfeiffer's in Wahgunyah, where Azure Kingfishers had nested recently. Sunday Creek flows behind Pfeiffer's cellar door and Pfeiffer's use the bridge over the creek as a great spot for functions. A large tree has recently fallen into the creek, and the kingfishers nested in the soil clinging to its bole. What a tiny hole they used! They had finished nesting when I was there, but Jim and I stood on the bridge, hoping that a tell-tale flash of azure blue would alert us to the bird's presence. While we waited, we admired a Peaceful Dove which had nested in the dead branches of the fallen tree, quite safe from ground predators in the middle of the creek. We watched as one dove came to replace the other on the nest, and had a glimpse of the two round white eggs they were incubating. 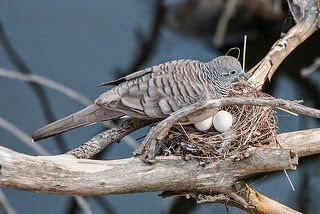 It was good to be able to look down on a dove's nest for a change. We had other things to amuse us too: Brown Treecreepers, Willie Wagtails, Red-browed Finches, ducks, cormorants and platypus. Then, finally, our patience was rewarded: a flash of blue landed on the dead tree. I gasped involuntarily. Azure Kingfishers always take my breath away. Thank you, Jim! The other highlight was at No 2 dam. There's always something good at the gate here. On this occasion, it was a vocal Mistletoebird. I walked the track to the bird hide, and along the way accumulated a list of some 15 species. Dusky Woodswallows were everywhere. At the hide, I could hear Black-chinned and Fuscous Honeyeaters. Then I heard a bird I could not identify. I tracked it down and discovered it was a Grey Shrike-thrush, but it was not making a thrush call. It was mimicking, something I had not witnessed before. Unfortunately, the thrush did not appreciate my attention and flew away. As soon as I was home, I reached for my HANZAB. Alec Chisholm did a lot of work on birds mimicking, going back to the 1930's and sure enough, he had several reports of Grey Shrike-thrushes mimicking both at rest and while feeding. 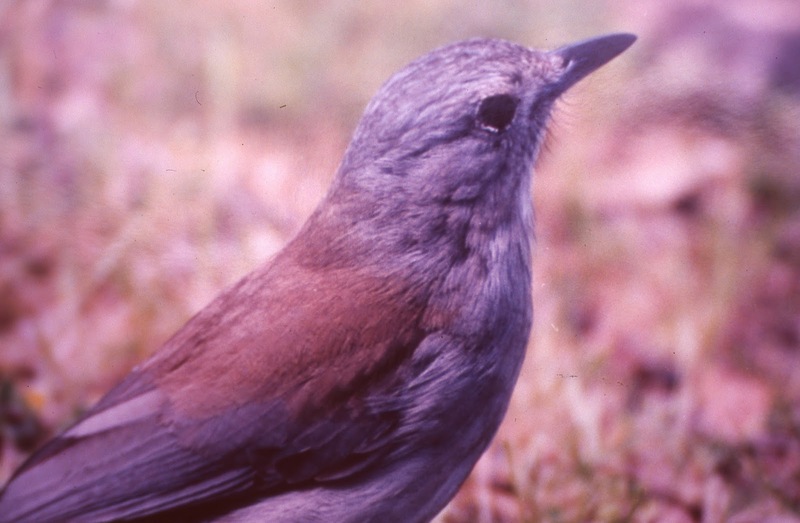 There were just two other reports: one from someone called Bridgewater in 1933, who reported that a thrush copied a possum squeal and one from someone called Jackson in 1995 saying that a thrush mimicked a Golden Whistler in the Big Desert. Clearly, I had seen something which has not been reported a great deal. I'm sorry that I did not see and hear more. There's always something interesting in the Rutherglen district. I can't wait to go back. I found your blog through a search. Just the other day I heard what was definitely a Sacred Kingfisher call from my neighbour's Ash Tree. But the end of the seque ce wss the characteristic musical whipcrack of the grey thrush. I was gobsmacked, and considered whether it could be two birds. But no, it was one because the whole sequence repeated two more times. Fabulous.